An avid collector of Breyer model horses for over 20 years, Karen recently began merging two of her passions - art and horses - together by customizing model horses. She works in mixed media, primarily using copious layers of pastels to bring a life-like realism and fur-like softness to each piece, resulting in a model radiating with depth of color and award-winning beauty. 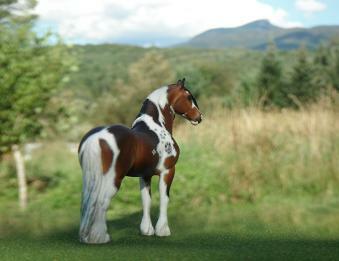 Fine details including eyes, hooves and white markings are carefully painted in artist quality Golden acrylics. Almost every horse painted by Karen has double-qualified in both breed and workmanship classes, with most going on to win Top Tens in recent North American Nationals (NAN).